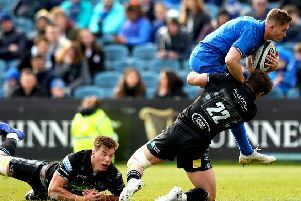 Glasgow assistant coach Kenny Murray admits that the problems surrounding the Scotstoun pitch are “frustrating” but said the players were looking forward to playing on Kilmarnock FC’s 3G surface at Rugby Park again when they face Munster in the Guinness Pro12 tomorrow night. The Warriors haven’t played at Scotstoun since 12 December and the frequent bouts of heavy rain have kept the pitch in an unplayable state. “A lot has been written about the pitch. Everybody knows it’s been frustrating not playing at our home venue,” said Murray. “But the Kilmarnock pitch, when we played Racing there [on 23 January], the boys enjoyed it. It was a good performance and a good victory. Head coach Gregor Townsend will name his team today, with the possibility of Scotland squad players being available, as the Pro12 champions look to get back to winning ways for the first time in the league since the end of November. Murray added: “Munster are a very good side. Every game against them has been tight. They’ve not lost a lot of guys in the Six Nations window, not as many as us, and they are a very physical side.They have some big forward runners and some strong midfield players. Glasgow will be looking to rebound from last week’s 13-10 loss in Ulster, which kept them eighth in the standings. “It was quite frustrating for us, we played some good rugby,” said the former Ayr coach. “We defended really well for periods of the game.